Open daily 9 a.m. to 5 p.m. including most holidays. The Aquarium is closed on Thanksgiving Day and Christmas Day. The Aquarium closes early for the October Halloween event, Trick or Treat Under the Sea, and the December Santa-by-the-Sea event. Every day we offer fun and educational programs inside the Aquarium that are free with admission. We also offer special programs for a small extra fee like behind-the-scenes tours and outdoor programs. Check out our calendar to find out what's happening today at the aquarium. Don't forget to look at our special events page also. The Aquarium admits all visitors free of charge on Veterans Day, Nov. 11 and the Martin Luther King Jr. holiday on the third Monday each January. GROUP DISCOUNTS: Group discount rates apply to civic organizations and out of state school groups only. These groups of 15 people or more will qualify for 15 percent off admission, when the group registers in advance and purchases all tickets with one payment. A 25 percent discount is available for 50 or more tickets purchased in advance. Register online or call us at 252-247-4003 x290 or x225. NC SCHOOL GROUPS: North Carolina school groups, including North Carolina home-school groups, are admitted free if registered in advance. The Aquarium is a favorite field trip for North Carolina schools. Teachers, these visits MUST be scheduled in advance. Allow plenty of time to enjoy the Aquarium’s five galleries, view the 40 exhibits, take in the daily free programs, stroll the boardwalk or venture along the nature trails. A visit to the Gift Shop and the on-site Dairy Queen® also deserve a spot on your itinerary. For more information or to register call us at 252-247-4003 x290 or x225. The Aquarium's expansive galleries can accommodate large crowds. But, if you like things a little quieter, consider the first two hours in the morning and the last two hours in the afternoon, which are not as busy as mid-day. Summer is the busiest time of year. Fall, winter and spring are great times to visit. Parking: Parking is free. If the lots are full, look for angled parking on the entrance road. Please park only in marked spaces. Bus and RV space is reserved in the far lot, to the left as you enter the grounds. Bicyclists, look for the bicycle rack near the entrance. Accessibility: The parking lot, entrance, exhibits, restrooms and marsh boardwalk are accessible to wheelchairs. Parking for visitors with mobility disabilities is near the entrance. Wheelchairs for loan: The Aquarium has five wheelchairs available for use at no charge. Check one out at Visitor Services by providing a photo ID such as a driver’s license. Strollers: Strollers are permitted. 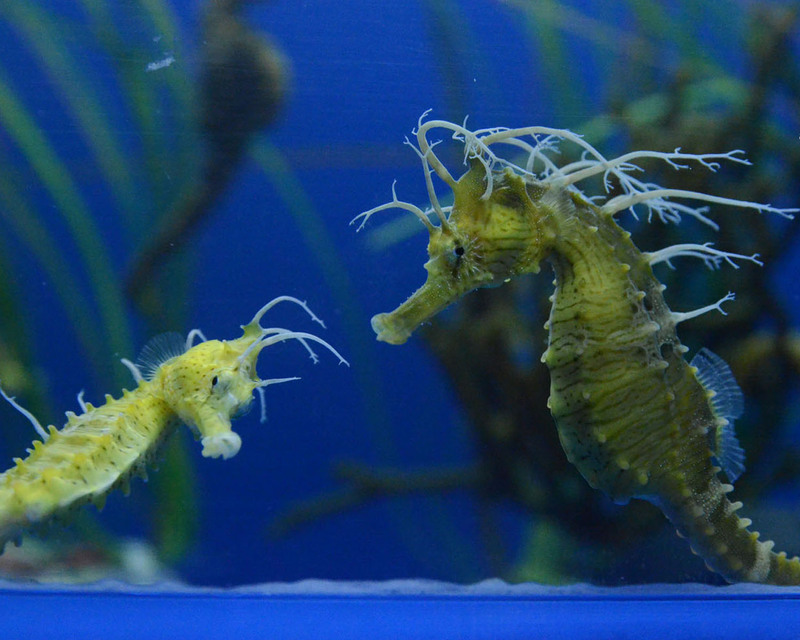 The Aquarium offers strollers for use at no charge on a first come, first served basis. Check one out at Visitor Services by providing a photo ID such as a driver's license. Food and Drink: Please remember, ONLY our animals get to eat inside the Aquarium – no food or drink allowed indoors. Enjoy your refreshments on the snack bar’s adjacent deck, or relax on one of the picnic tables on the far side of the main parking lot. Tables are available first-come, first-served. The on-site Dairy Queen is closed for the winter and will reopen in March. Frank's Franks food cart will be open during the winter hours December until March: Thursday, Friday, Saturday and Sunday 10:30 a.m. ro 2:30 p.m. Smoking: Smoking must be confined to the designated smoking area, clearly marked near the entrance. Pets: Leashed pets are allowed in the parking area and on the Theodore Roosevelt Nature Trail. Comfort and emotional support animals are not allowed inside the Aquarium per ADA and AZA regulations, only trained service animals are allowed in the Aquarium. Please inform Visitor Services or a Security staff member if a trained service animal will be assisting you during your visit. Flash: Built-in flash devices on still cameras are permitted. However, flashlights, laser pointers and video lights are not. They can startle Aquarium animals, endangering them and the divers that might be in the exhibits. Please keep these and any other lighting devices off as you tour the Aquarium. Commercial photography and filming: The Aquarium’s Public Relations department must approve of videotaping or photographing on Aquarium grounds for commercial use or student projects. Auxiliary lighting, power cords, cumbersome equipment or other trip hazards are not permitted during operating hours. Contact Public Relations for complete guidelines and restrictions. Wedding photographers should check with the special events coordinator.